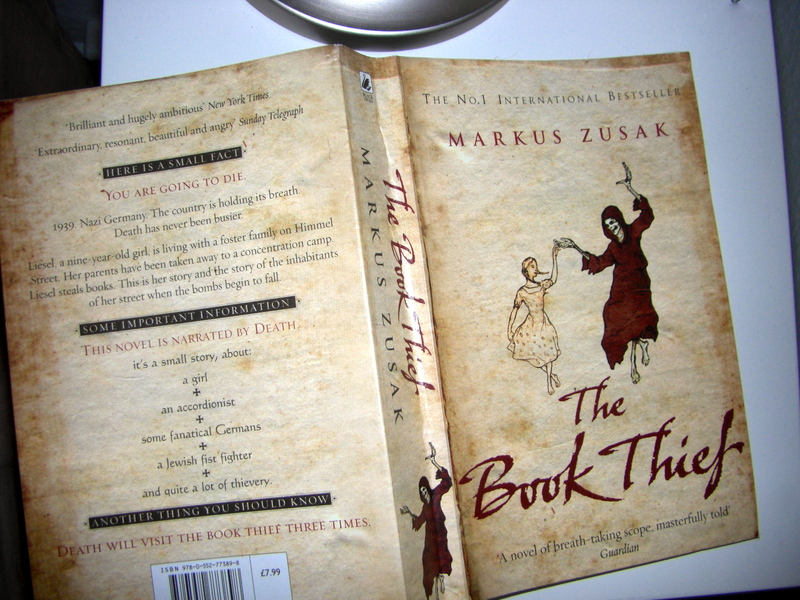 Bedtime reading for this month has been The Book Thief by Markus Zusak. The narrator is Death himself, seeing color where death occurs and taking a liking to a little girl named Liesel, who lives with foster parents at Himmel (did anyone say loaded?) Street. Through Death we learn about Liesel’s life. Her constant nightmares about her dead brother leads to a bonding session with her stepfather, who helps her in her struggle to learn to read well. Her mother (the communist) who has ‘disappeared’ and the boy next door who craves a kiss from her. All is set in and around WWII, where people are acting strange, children are being punished by terrified parents for smearing themselves with charcoal in an attempt to imitate the great Jesse Owens, or displaying negative feelings about Hitler in public. The point that Death is the narrator is interesting. He is not an intrusive narrator in the classical sense as the one butting in on every sentence, knowing it all and letting the reader know his omnipotence. He knows everything and remarks it at times, but mostly he is someone who hovers over the story and gives tips and tiny remarks at selected areas. I am partial to stories that have historical footnotes, tidbits and ‘did-you-know-facts’ inserted in novels. I like the humane, not too artsy, feeling a story gets when you actually place it in context and the narration itself makes an investment in the story. One other such book I think of here is Junot Díaz’ ‘The Brief Wondrous Life of Oscar Wao’. Here the footnotes are a big part of the story. Normally it is a mantra ‘If it is a sentence put it in the text’, but Díaz uses footnotes as a way to interfere with a reading process that is linear, by breaking it off at places, introducing historical facts, character descriptions, cultural references and slang explanations. I am no expert, but I do see these kind of techniques more and more in modern and post-modern works and am leaning towards the attitude the reader has taken to books in modern era. The Book Thief is now a quarter read. Liesel has just discovered one of her stepmother’s customers’ library and I feel kinship with her enthusiasm for the book and all it stands for. The book also introduces the incredible power a book can have when it does have something to say. The burning of books is a violent symbolic action, but also very half-thought impulsion. The thought process doesn’t go away if you burn the physical entity. Granted, it can impair the spreading of said thoughts, giving it a royal kick in the funsies. But in other areas it can be the exact royal kick in the funsies that literature needed. It is often said that great art is to be found in recession. An inclination towards the struggle and pain being positives and joy and uncomplicated life acting as negative counterparts. As long as one remembers not to revel in sorrow, but remember that the struggle is in fact to get to some kind of unity and meaning.